The observatory is located on the rooftop. The first dome has a 45-cm Cassegrain reflector, with higher resolution power. It is only available for astronomy research and teaching purposes, and is not open to the public. 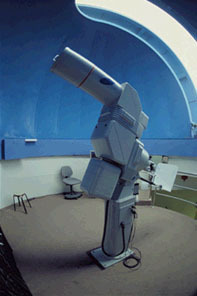 In the second dome, there is a 20-cm Coude refractor. People can view celestial objects with their own eyes, exploring the Universe for themselves. The observatory is kept open for extra hours at each special astronomical event, to give the public a chance to observe rare phenomenon.